Eagles Recalled by Warren Carroll. An extremely professionally written and researched book with hundreds of colour high resolution photographs, printed on quality paper. The author has drawn from numerous private and public collections in addition to his own to illustrate the variety of insignia that has been worn over the years, including many extremely rare examples. An absolute must for the serious collector. 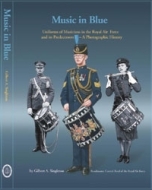 Link to: Warren Carroll's website "the WingNut.Ca"
Music in Blue, Uniforms of Musicians in the Royal Air Force and its Predecessors - A Photographic History by Gilbert A. Singleton Bandmaster, Central Band of the Royal Air Force. The title says it all, as it contains a wealth of black and white, and coloured photographs of musicians from RFC, RNAS, RAF and associated bands. The author has compiled the photographs from private and public sources, many of which have never previously been published. An excellent study of musicians uniforms from the early days of British aviation through today including many rare images and a number of privately commissioned watercolour illustrations. Starting where the Part 1 left off, this publication covers the uniforms, insignia of the RAF including the WRAF. Numerous period photographs from the archives of the Royal Air Force Museum at Hendon have been called upon to illustrate the author's informative descriptions. Flying clothing of the RFC, RNAS and the RAF is additionally documented and described. Combined with the previous part, this book offers collectors and historians with many useful facts relating to early aviation militaria. Andrew Cormack explores the history of the uniforms of the RAF throughout the Second World War, in a text accompanied by numerous contemporary photographs and eight full page colour plates by Ron Volstad. Flying clothing is also covered in this publication. Although the Osprey series are slim in comparison to many of the more specialist books, this edition clearly demonstrates how to achieve value for money publishing. A great addition to any library. 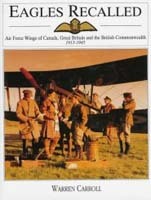 As the title "Military Pilot & Aircrew Badges of the World" alludes to this book provides a broad overview of wings. Illustrated with many black and white photographs. Believed now to be out of print, having originally been published in 1982, by R.James Bender Publishing.